Heritage Ability finalists in the National Lottery Awards! 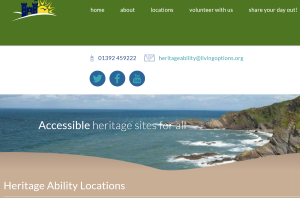 Heritage Lottery Fund-supported charity Heritage Ability, covering the south west of England, reports that it has made it into the final 7 in the heritage category of the National Lottery Awards, and seeks public support to move further. We are making heritage places more accessible across a range of disabilities and for British Sign Language users, doing all we can so that the destinations we love can be enjoyed by everyone.. The South West of England is brimming with heritage; from country parks, to historic houses, castles and rugged coastlines. It’s here to be enjoyed by everyone – but not everyone can. Disabled and Deaf people (who use British Sign Language) struggle to experience these places because of physical barriers, a lack of accessible interpretation and untrained staff and volunteers. That’s where Heritage Ability comes in. We’re unlocking the heritage at over 20 destinations across Devon, Dorset, Cornwall, Somerset and Gloucester so that disabled people and British Sign Language users can have engaging experiences with the places that we love. We’re creating Easy Read guides to large print formats, BSL tours and more – connecting people with places. It’s thanks to Heritage Lottery Fund that we can make heritage accessible – for everyone. This entry was posted in Sector NewsBlog. Bookmark the permalink. IHBC’S NewsBlogs usually only summarise third party reports. Links to other sites may not be active so you may need to contact the host site for the original text.